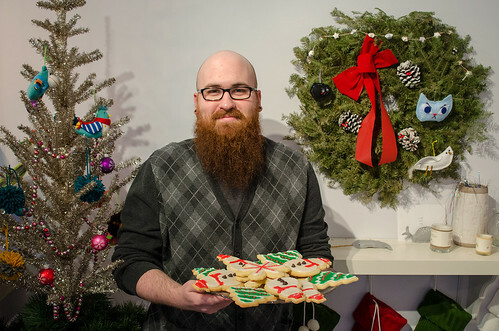 LIGHT GREY ART LAB: Light Grey Cookie Party- Recap! Light Grey Cookie Party- Recap! 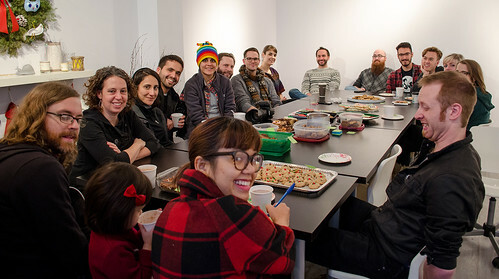 Thanks to everyone who stopped by last week for our annual Light Grey Cookie Party! We had a wonderful time tasting the holiday cookies, making hot chocolate, and celebrating the end of the year with all of you! This year's Light Grey Cookie Party featured a HUGE selection of baked goods, bars, frosted treats, and more! Throughout the afternoon, we taste tested many of the holiday creations and were able to vote on some of the most interesting, best looking, and best tasting desserts! The winners included Ian's frosted sugar cookies (seen above), Anna's traditional gingerbread, and Jason's orange, ginger, and cranberry cookies! If you missed the party or want to see more details, you can check out all of the photographs from the Light Grey Cookie Party on the Light Grey Flickr page here! Thanks for celebrating with us, and we hope to see you in 2015!